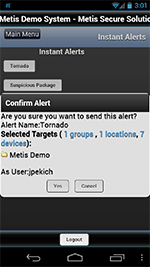 Metis Secure introduces a mobile interface designed for safety and security personnel to warn everyone at their sites of an impending emergency. The mobile interface allows designated personnel to launch instant, pre-recorded alerts to IP phones, computer screens, digital signs, PA speakers and other facility devices. Users can also build and send custom alerts and directives using a text-to-speech function.